A new group has taken over the Freedom for Öcalan Vigil held in front of the Council of Europe (CoE) in Strasbourg, France in the 328th week of the demonstration. Kurdistanis living in Normandy, France Delil Ates, Haci Bayram, Ersin Tektas and Ridvan Ferqin have taken over the watch that was held by women from the UK last week. 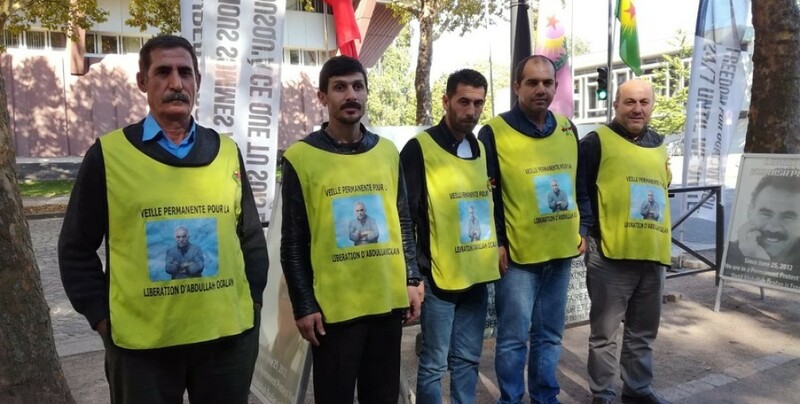 The new watch group has protested the ECHR’s verdict issued last week, which rejected the appeal about the physical violence Öcalan was subjected to by wardens in the Imrali prison in 2008 due to “lack of evidence”. The activists pointed out that the verdict is in violation of the European Convention on Human Rights provisions and stressed that the “legal basis” for the restriction of rights for Kurdish People’s Leader must be explained. The activists issued a statement and said financial ties have come out on top in an atmosphere where the AKP-MHP fascism throws around threats every day and pointed to the contribution European countries made to the Kurdish-Turkish conflict.